For the biological process, see Decomposition. Thermal decomposition, or thermolysis, is a chemical decomposition caused by heat. The decomposition temperature of a substance is the temperature at which the substance chemically decomposes. The reaction is usually endothermic as heat is required to break chemical bonds in the compound undergoing decomposition. If decomposition is sufficiently exothermic, a positive feedback loop is created producing thermal runaway and possibly an explosion. The reaction is used to make quick lime, which is an industrially important product. Some oxides, especially of weakly electropositive metals decompose when heated to high enough temperature. A classical example is the decomposition of mercuric oxide to give oxygen and mercury metal. 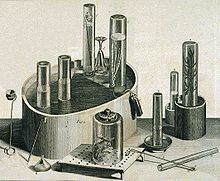 The reaction was used by Joseph Priestley to prepare samples of gaseous oxygen for the first time. When water is heated to well over 2000 °C, a small percentage of it will decompose into OH, monatomic oxygen, monatomic hydrogen, O2, and H2. The compound with the highest known decomposition temperature is carbon monoxide at ≈3870 °C (≈7000 °F). Ammonium dichromate on heating yields nitrogen, water and chromium(III) oxide. Ammonium nitrate on strong heating yields dinitrogen oxide ("laughing gas") and water. Ammonium nitrite on heating yields nitrogen gas and water. Barium azide on heating yields barium metal and nitrogen gas. Sodium nitrate on heating yields sodium nitrite and oxygen gas. Organic compounds like tertiary amines on heating undergo Hoffmann elimination and yield secondary amines and alkenes. When metals are near the bottom of the reactivity series, their compounds generally decompose easily at high temperatures. This is because stronger bonds form between atoms towards the top of the reactivity series, and strong bonds break less easily. For example, copper is near the bottom of the reactivity series, and copper sulfate (CuSO4), begins to decompose at about 200 °C, increasing rapidly at higher temperatures to about 560 °C. In contrast potassium is near the top of the reactivity series, and potassium sulfate (K2SO4) does not decompose at its melting point of about 1069 °C, nor even at its boiling point. ^ Baykara, S (2004). "Hydrogen production by direct solar thermal decomposition of water, possibilities for improvement of process efficiency". International Journal of Hydrogen Energy. 29 (14): 1451–1458. doi:10.1016/j.ijhydene.2004.02.014.